The most widely used cellular mobile broadband network technology is based on the 3GPP standards. The history and background of the 3GPP technology is in the Global Mobile Service (GSM) technology and the work done in European Telecommunications Standards Institute (ETSI). This primary voice service network has evolved to be the dominant mobile Internet access technology. Deploying IPv6 in 3GPP Networks covers how Internet Protocol version 6 (IPv6) is currently defined in the industry standards for cellular mobile broadband, why and how this route was taken in the technology, and what is the current reality of the deployment. Furthermore, it offers the authors’ views on how some possible IPv6 related advances 3GPP networks may be improved during the coming years. It gives guidance how to implement and deploy IPv6 correctly in the Third Generation Partnership Project (3GPP) mobile broadband environment, and what issues one may face when doing so. 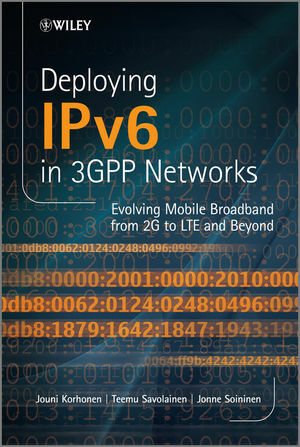 The book covers 3GPP technologies from 2G to LTE, and offers some ideas for the future.